BUDDY KNOX was the man who put Tex-Mex music on the map, registering the genre's first No.1 and million-seller, Party Doll - recorded at Norman Petty's tiny studio in Clovis, New Mexico - in the early Spring of 1957. And although Knox would ultimately be eclipsed by another great Texan buddy, Buddy Holly (who also, of course, recorded the greater part of his timeless legacy at Clovis), he enjoyed a hot streak of his own during the late 50s and early 60s, clocking up a healthy run of hits. Indeed, he was the first artist of the R&R era to write and record a No.1 record, and by 1958, Knox - along with colleagues Jimmy Bowen and The Rhythm Orchids - had sold upwards of 5 million records. 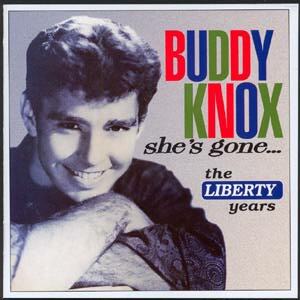 But somehow, in spite of - or more probably, because of - his commercial successes, Buddy Knox's name never quite seemed to stir the collective loins of R&R's self-appointed cognoscenti as did some of his more obscure, often far less-talented contemporaries. For starters, although steeped in Country, R&R and Rockabilly, Buddy's Tex-Mex music had fewer rough edges: his singing style was jaunty and easygoing rather than fast and frantic, relaxed rather than highly-strung. Furthermore, having been to university, he was an educated, intelligent and highly articulate man, pretty much the antithesis of a great many of the rednecks and yokels whose Rockabilly 'credentials' allegedly eclipsed his own. Buddy nonetheless went on to carve out a long, successful career, ultimately spending more than 40 years on the road, gigging regularly right up until his sad death, from cancer, in February 1999. He remained a magnificent live performer throughout his life - perhaps never better evidenced than his performance at The Rainbow in 1976, when, as a late addition to the bill, by common consensus Buddy stole the honours at The Sun Sound Show over Jack Scott, Warren Smith and Charlie Feathers. Although he enjoyed his biggest commercial successes in the 50s, with Roulette Records, Buddy's four-year spell with Liberty Records between 1960-64 yielded a first-class body of work. (NB: all quotes in the following text are drawn from Buddy's BBC Radio London radio interviews with Charlie Gillett and Stuart Colman, and earlier interviews with New Kommotion editor Adam Komorowski). Wayne 'Buddy' Knox was born on July 20th 1933, on a farm just outside a minuscule town called Happy (pop: less than 700), in West Texas. As he told BBC Radio London presenter Stuart Colman on Echoes in 1983: "I grew up on a farm and when we'd finished our chores at night we didn't have nothin' to do. We didn't have television...we had a big old radio that ran off batteries, off a generator, and we only ever played it when my parents wanted to hear a specific show. They'd gather around the radio like people gather around the TV now, and they'd listen to certain Country programmes. When the programme was over they'd shut the radio down and turn the wind-charger off." "Back during the war my mother's family had their own religious musical radio show. It was all basically Gospel-type music, so I grew up on Gospel music - not the real Southern, Black Gospel music, but more the traditional White Gospel music. The other music I was hearing was Country ... Hank Williams, Jimmie Rodgers, Eddy Arnold. I grew up listening to those sort of things, so I guess it was just natural that sooner or later I was gonna pick up a guitar ..."
"I traded a guy something for an old, beat-up guitar, and I tried to teach myself to play the thing. I'd get behind a barn, a haystack, wherever I could ... I'd sit down, and start messin' around with it. My Aunt played really good, and sang like a bird, so, I'd sit down with her and she'd teach me a chord here, a chord there. But I was just a kid at the time and the strings hurt my fingers, so I figured out a different way to play it. I'd tune the guitar to an open G, and I'd bar the chords with my fingers, just like Don Everly and Bo Diddley did later. I didn't know many songs, so I started trying to make up my own. I wrote "Party Doll" and "Hula Love" years before I recorded 'em ... way back around 1948, when I was still just a kid." By 1954 Buddy was attending the West Texas State College in Dumas, studying accountancy & business administration. While he was there he teamed up with with a pair of fellow-students, Jimmy Bowen, who played double bass, and guitarist Donny Lanier, and formed a group, The Serenaders. Having initially got together just to sing and pick for their own amusement, they graduated to playing local schools, dances, and bars, eventually changing their name to The Orchids. Along the way they added a drummer, Don Mills, who'd climbed up out of the audience one night armed with just a pair of brushes and proceeded to play 'drums' on a cardboard box: "... all of a sudden the floor was full of people dancing. Our whole sound changed right there!" Names like Buddy Holly, Roy Orbison and even Elvis have been bandied around as having been the catalyst who encouraged The Orchids to start taking their music more seriously - and in truth, it's likely that they were all important points of reference. But it does seem to have been Roy Orbison who pointed them towards Norman Petty's recording studio in Clovis, some 150 miles across the State line in New Mexico. Knox, Bowen and Lanier eventually pooled their resources - $60, so legend tells us - and drove to Clovis (Mills, who was still at school, couldn't make the trip) where they spent three nights recording. During the sessions, the trio were augmented by local musicians: "We'd discovered that Jimmy couldn't play bass well enough for Petty to record him, so we found this young guy hanging around the studio who played pretty good bass, and we hired him. Then we needed a drummer...there was another young guy hanging around, Dave Alldred, he'd been in the Norman Petty Trio (Alldred subsequently became The Orchids' regular drummer). We had a girl from Clovis High School playing the cymbals, and my sister and her friend, plus a couple of The Roses, singing back-up vocals." They ended up with two finished cuts, Party Doll, on which Buddy took lead vocals, and I'm Sticking With You, which Jimmy Bowen sang. Petty gave each of them a couple of acetates: "We just went back home with the darned things ... we knew nothing about the business at all - the only thing we'd gone to Clovis for was just to have a couple of copies of the record!" But everyone who heard the disc was impressed and eventually, a local businessman pressed up 2,500 copies of Party Doll/I'm Stickin' With You on a custom-label, Triple-D (named after a Dumas radio station, KDDD, on which The Orchids had played) to sell in local stores. By all accounts a local deejay, Dean Kelly, began playing Party Doll on an Amarillo station, and it became something of a local hit. Meanwhile, Don Lanier's sister was working in New York, where she passed a copy of the disc to music publisher Phil Kahl, a junior partner in a new record label being formed by Morris Levy and George Goldner. Kahl immediately installed himself as The Orchids' manager, and ultimately, Party Doll and I'm Stickin' With You became the first two releases on the new Roulette label, credited to 'Buddy Knox & The Rhythm Orchids' and 'Jimmy Bowen & the Rhythm Orchids' respectively: "We'd called ourselves The Orchids originally, because we all wore orchid-coloured shirts. When we got to New York, the people at Roulette decided it wasn't such a jazzy name, so they changed it to The Rhythm Orchids. Also, they though both were hit records, so they put 'em out separately." Roulette had got it spot on: boosted by a memorable appearance on the Ed Sullivan Show Buddy went all the way to No.1 with Party Doll, whilst Jimmy climbed to No.14 with I'm Stickin' With You, each disc selling well in excess of a million copies. The Rhythm Orchids immediately found themselves caught up in a maelstrom of activity: "When we first went to New York we opened at the New York Paramount Theatre, a 10-day show with The Platters and Frankie Lymon & The Teenagers. We were scared to death ... I'd never seen a crowd that big in my life. It was our first real professional show ... back home in Texas we'd been playing for $5 here, $5 there, and all the beer we could drink, in little bars and joints. We hadn't even had a proper drummer, it'd been just Jimmy, Donny and me." Buddy & the Rhythm Orchids subsequently carved out a big reputation on the Alan Freed packaged tour circuit and, between 1957-59, he registered eight further Top 100 entries, enjoying huge hits with Rock Your Little Baby To Sleep, Hula Love (another million-seller), Somebody Touched Me and I Think I'm Gonna Kill Myself, the latter selling well despite being banned in several states due to its contentious lyric (NB: for the full story of Buddy's Roulette career check out the Sequel double-CD Buddy Knox/Jimmy Bowen & the Rhythm Orchids - The Complete Roulette Recordings NEDCD 276). However, their relationship with Roulette was proving rather less than idyllic: "We'd had disputes over royalties. We really didn't understand the business, and our percentage was very small. On the other side of the coin, Roulette was paying for everything for us...all the hotel bills, the travelling, and things like that...we'd gone out on a lot of promotional campaigns. But then, we were selling so many records in those days - we sold over four million in 1957 alone - and we just figured we ought to have more money coming. We had a couple of fights over it, and in the end sort of reached a reasonably happy medium." Buddy had unwittingly engaged some real heavyweight help in sorting out his problems: "Allen Klein was a young accountant, straight out of university...he was young and fresh, like we were. He came along and befriended myself, Jimmy Bowen, Bobby Darin, Neil Sedaka and a few of the other guys ... we were all looking for someone to look after the books, to handle the taxes and things like that. Klein was very sharp, a very good accountant ... he saved us some nice tax money and he directed our business interests into what we figured was the right direction." "But over and above the royalty disputes I was unhappy with Roulette at the time, anyway, because they'd taken my artistic creativity away. I wasn't trying to be a big shot, or anything, I just wanted to cut records like I wanted to, and keep that downhome Tex-Mex style that we'd got down in Clovis. But they'd added Hugo & Luigi to our team (NB: Hugo Perretti and Luigi Creatore had in fact purchased George Goldner's Roulette shares), and I have to say I never enjoyed working with the guys. They were talented men, sure, but they wouldn't let me - or Jimmy Bowen - do anything. They were taking us down the wrong direction ... they were doing smooth, puffy-type Rock & Roll, but we still wanted to do raunchy, good ol' Tex-Mex Rock & Roll and Rockabilly. They took all that out and they added a sort-of Jazzy, Uptown feel to it - and if you hear a Texas guy, like me, trying to sing Uptown, Jazzy Rock & Roll, that's hideous, y'know. They were doing the best that they could, they just didn't understand that we couldn't do that sort of stuff ..."
"So, when it got to the point to where our contract came up for renegotiation, I'd already been talking with Snuffy Garrett and Liberty Records. And as soon as the contract ran out I just flew to L.A., signed, and we went straight into the studio and cut 'Lovey Dovey'"
"Snuffy used to be a disc jockey in San Angelo, Texas ... I hadn't actually known him in Texas, but I'd heard of him and he'd heard of me and my band, and he'd played our records. When he got to L.A. he'd suddenly, overnight, become a huge producer, a big success, and I signed with Liberty because of Snuffy. I wanted to work with him because he was on a hot streak, and you always want to go with a hot guy if you can. He had myself, Bobby Vee, Gene McDaniels, Johnny Burnette, a whole stack of 'em, and he was successful on every artist he had for many years." After a string of records at Liberty Buddy was on the move again: "The Liberty contract expired and Jimmy Bowen flew out and asked me to join him on Reprise, which I thought was a pretty good idea at the time. By this time Snuffy Garrett had semi-retired, 'cause he'd made a bomb...I hadn't much liked working with the other Liberty producers, so linking up with Jimmy again was a kinda natural move." A couple of years with Reprise brought no hits so Buddy moved on again, cutting a one-off single for the shortlived Ruff label (which he co-owned with Ray Ruff) before signing with United Artists, with whom he finally returned to the C&W charts in 1968 with Gypsy Man. By the early 70s he'd made his home in Canada, near Winnipeg. He got involved in local nightclubs and a couple of small record labels, and he'd spend anything up to 50 weeks a year touring, taking his easygoing Tex-Mex music to the world. A regular visitor to the UK, where his good-natured, unassuming personality and quiet professionalism always guaranteed him a warm welcome, he recorded in the UK on several occasions (check out Party Doll, Rockstar RSRCD 004). During the ninties he moved to British Columbia, Canada and worked and lived with promotor Les Vogt. They put a huge show on for Buddy's 60th at the Ranch owned by Vogt at the time. Guests included Tommy Sands and Red Robinson. In 1997 Buddy moved to Washington State. She's Gone "The Liberty Years"
Athough he'd enjoyed his biggest commerical successes in the mid/late 50's, with Roulette Records. Buddy's four-year stint with Liberty Records between 1960-64 yielded a memorable body of work. This included a couple of significant US hits, an unlikely UK chart entry, several further superb singles, and a fine LP with featured unusually excellent recuts of a handful of his earlier hits. Knox's entire released Liberty ouput is featured on this compilation, the majority of these sides appear on CD for the first time. Included is a full colour booklet with many photos and excellent detailed notes by Roger Dopson. WHAT IS YOUR GREATEST AMBITION --- START OWN PUBLISHING CO.
DO YOU HAVE A CAR --- YES, '57 FORD CONV. HOW TALL ARE YOU --- 5' 10"